Concrete floors will require concrete floor repair at some point. While concrete is incredibly strong, it still cracks overtime from everyday pressure. Without repairs, not only will the floor aesthetics suffer, its actual structure will weaken as well. Fortunately there are plenty of solutions available to improve the quality of your concrete, even if it’s already damaged. Whether you need concrete floor repair, restoration, maintenance, structural reinforcement, or waterproofing, a professional can analyze your unique circumstance and decide what the proper course of action. Repair a concrete floor and make it look new again. Almost any imperfection can be fixed, this includes holes, small and wide cracks. Repairs are an important part of the overall process to attain a flawless polished or epoxy floor. In order to reveal the canvas of your concrete, there might be VCT tiles or old epoxy that will have to be removed. 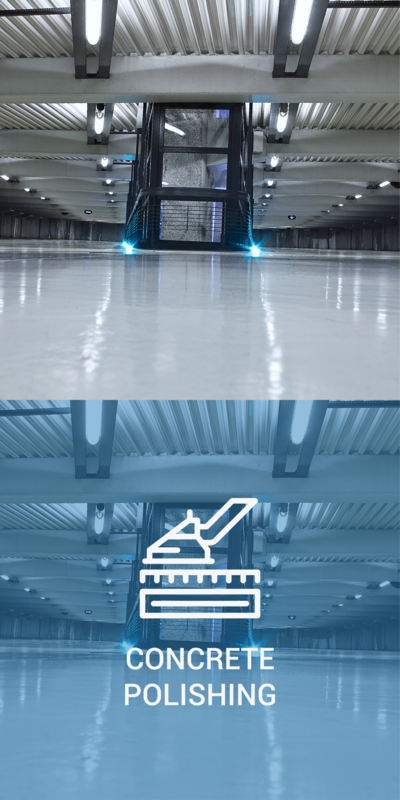 In order to remove damaged industrial floor coatings, we use grinders and stripping chemicals to remove the surface layer of your floor coating without wearing away at the concrete below. Trust in our floor repair solutions to then restore your floors back to their former glory. Waterproofing provides protection for floors or applications ranging from occasionally wet, to continuous water submersion. It is suitable as an anti-fracture membrane and for waterproofing, decks, kitchen floors and anywhere a waterproof or radon barrier membrane is required beneath thin-set installations. We offer floor maintenance programs after we install an epoxy floor or polished concrete. Floor maintenance will help with the durability and life of your floor for many years to come. Taking care of your floor will help cut down costs by not having to hire a contractor every 4-5 years and keep the floor looking is best for many years.